Hey, y'all! I'm sure by now y'all know that I love any kind of craft or home decor project, but one of my favorite things to make is DIY jewelry. That could be partly because I love jewelry myself, or maybe it's just because the possibilities are endless when it comes to creating handmade jewelry. 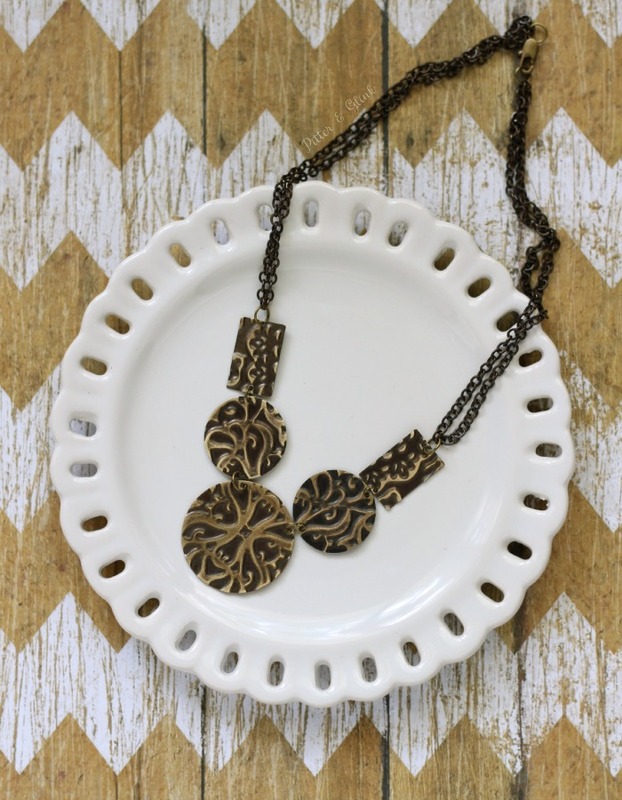 I love making jewelry that looks like it came from a chic boutique in Charleston or Savannah, and the necklace I'm sharing with you today would fit right in. 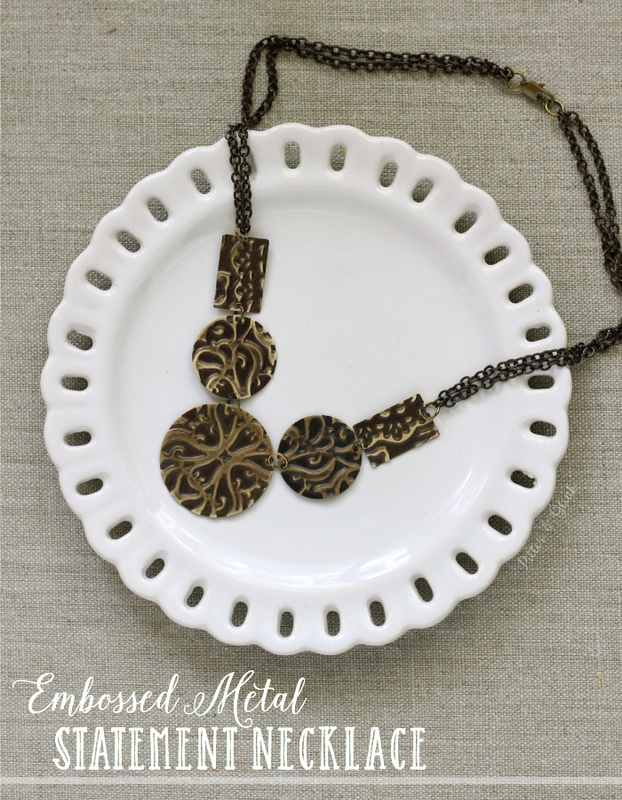 I'm calling it my Embossed Metal Statement Necklace, and it's easy and inexpensive to make with a Sizzix BIGkick Machine and Vintaj jewelry making supplies. 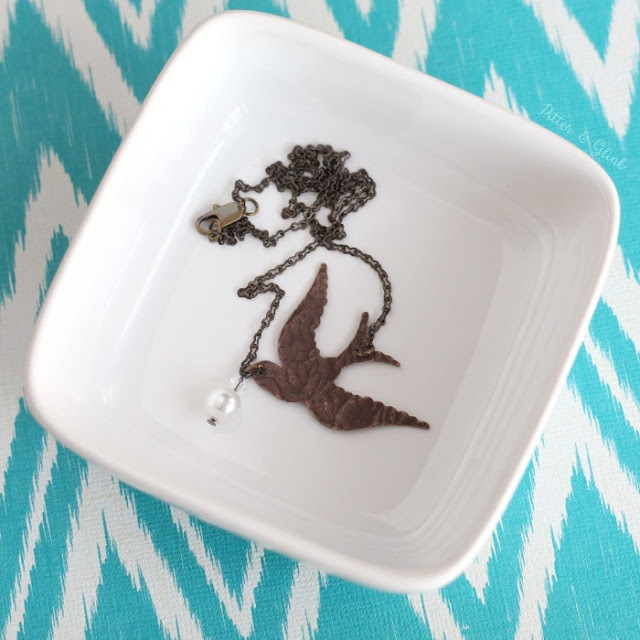 You'll need a few supplies to get started making your own necklace. 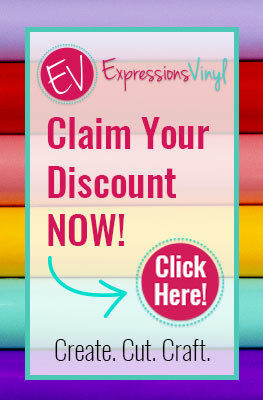 I was sent free product from Sizzix to create my necklace, but you can find the supplies online using the links below. Step One: Punch extra holes in each of the metal blanks. 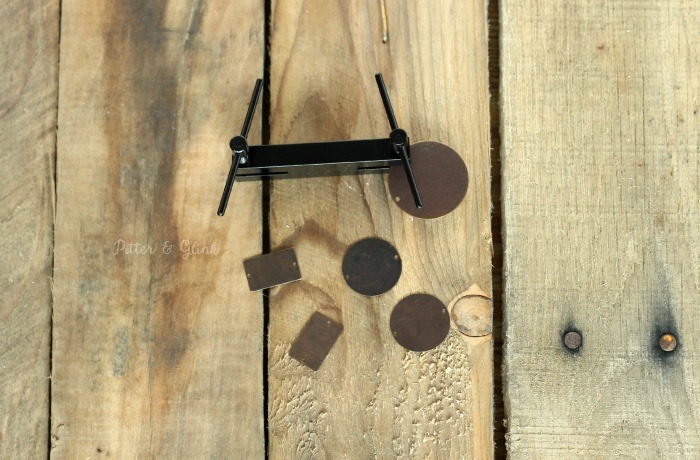 The metal blanks are sold with more than one blank to a pack, but you're going to use one of the large circular blanks, two of the small circular blanks, and two of the rectangular blanks to create this necklace. All the metal blanks come with one hole pre-punched. 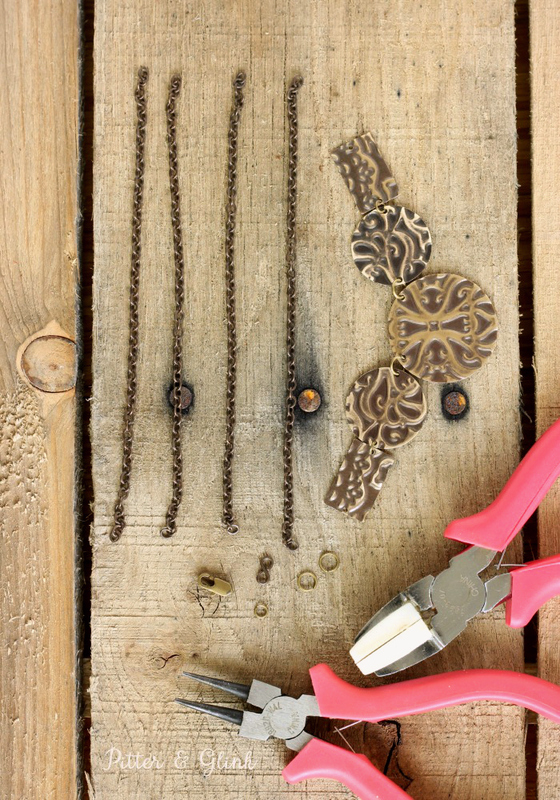 To create the metal statement necklace, each blank needs two holes. 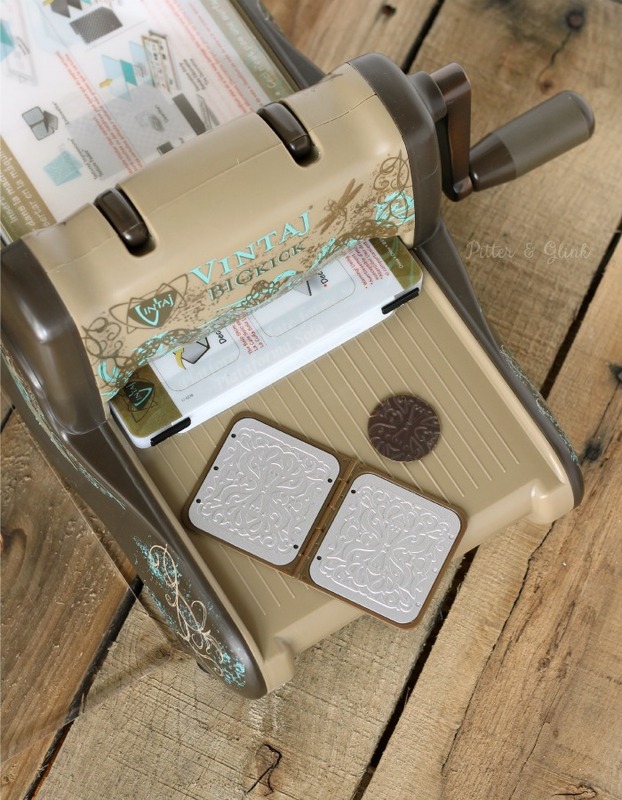 The rectangle and small circle blanks need a hole punched parallel to the pre-punched holes. The large circular blank needs a hole punched about 3/4" from the pre-punched hole. To punch the holes, you simply place the blanks into the punch and twist the handle until you punch through the metal. Step Two: Emboss the metal blanks using a Vintaj DecoEmboss Die. The awesome thing about the dies is that you can place blanks in different spots on the die and get a different pattern. 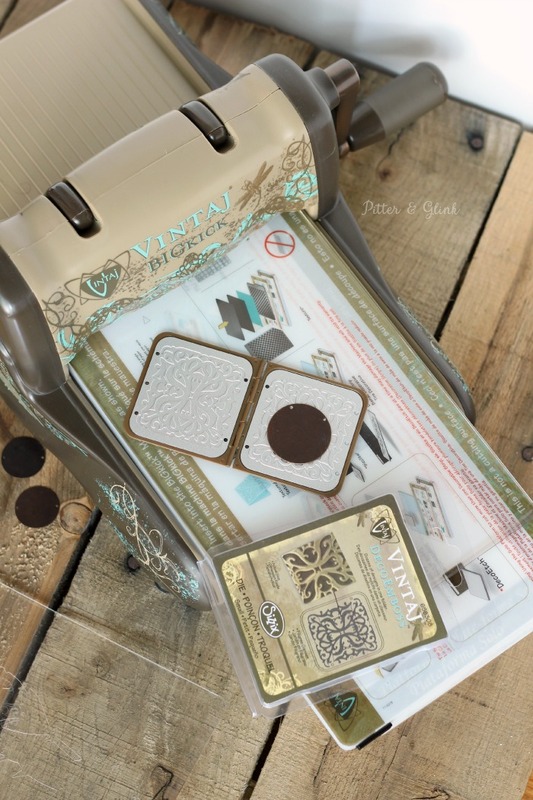 To emboss, simply place the metal blank over the desired part of the die and close the die. Center it between the clear cutting pads on top of the solo platform. Turn the handle of the machine until the solo platform and cutting pads reach the other side of the machine. 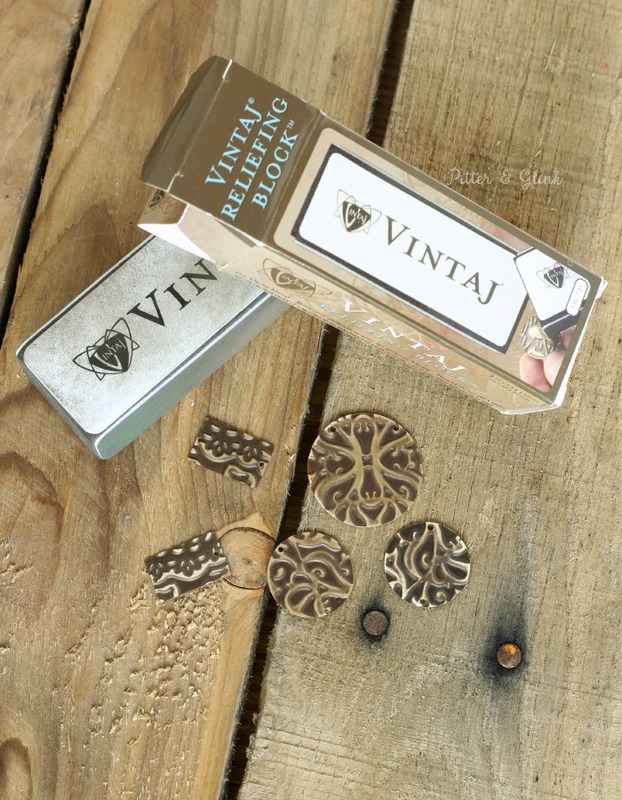 I used the Filigree Garden die for all the circular blanks and the India Archway die for the rectangular blanks. You could definitely use the same die for all the blanks though. See all the awesome texture the die creates? Well, it's there, but it's kind of hard to see. That's why the next step is important. Step Three: Use the Vintaj Reliefing Block to remove some of the dark "finish" from the raised portions of the blanks. This makes the pretty brass shine through in the high spots of the design and shows all that awesome embossed texture. Step Four: Use jump rings to attach the blanks together. You'll need four jump rings. I used both medium and small jump rings. Step Five: Cut the brass chain. The chain comes in one piece 24" in length. I cut the chain in half and then cut the halves in half using my wire cutters. I wanted to double the chain to make it look more substantial. 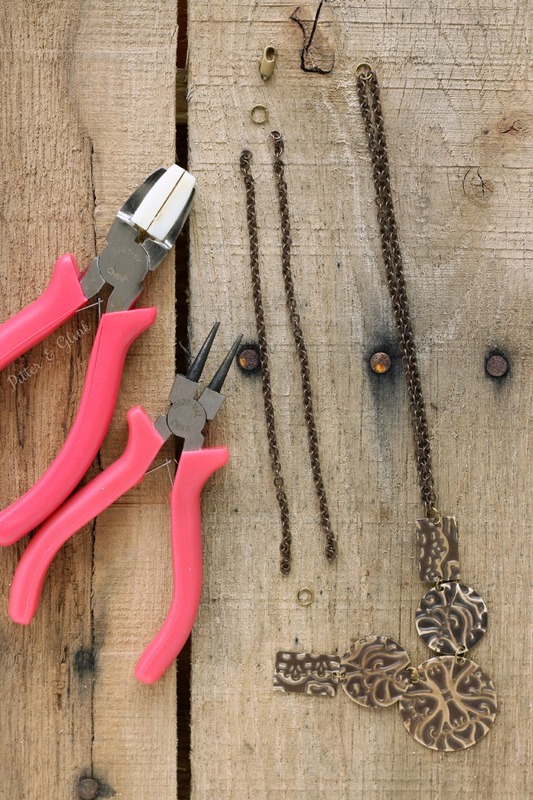 If you want a longer necklace, don't double the chain or simply use two different chains instead of one. Step Six: Attach your chain and clasp to the metal blanks. 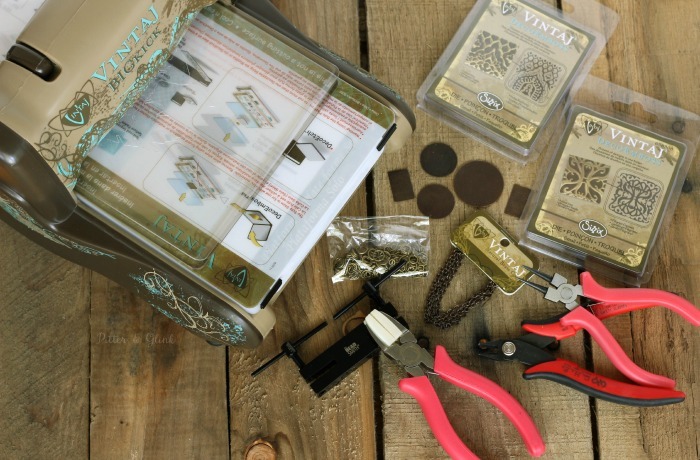 Attach a jump ring to the rectangular blank and thread both pieces of chain through it and then close the jump ring. Make sure your chain isn't twisted and then attach a jump ring to the other end of the chains. Repeat for the other side, making sure to thread a clasp onto the jump ring before closing. 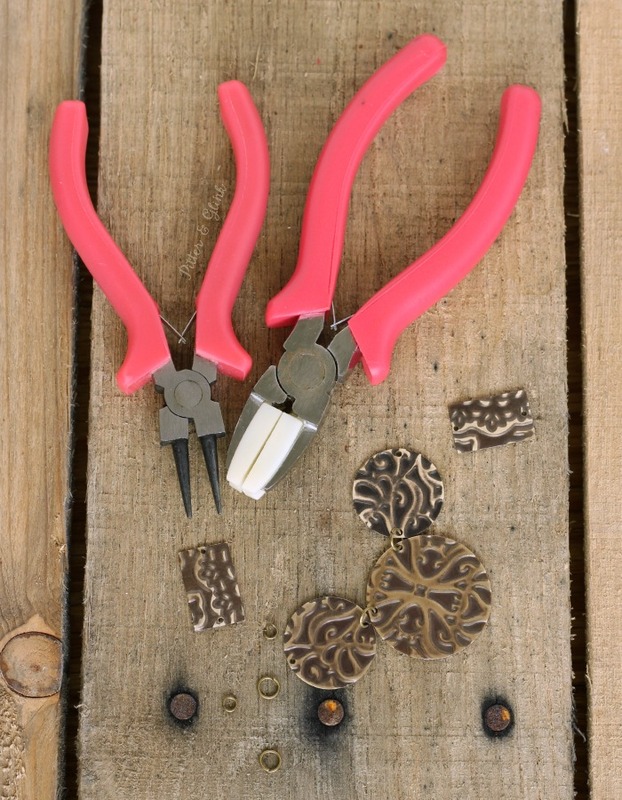 And that's all there is to creating a pretty embossed metal statement necklace! In the picture above, you can see how the light hits the raised portions of the embossed design, making it really pop. 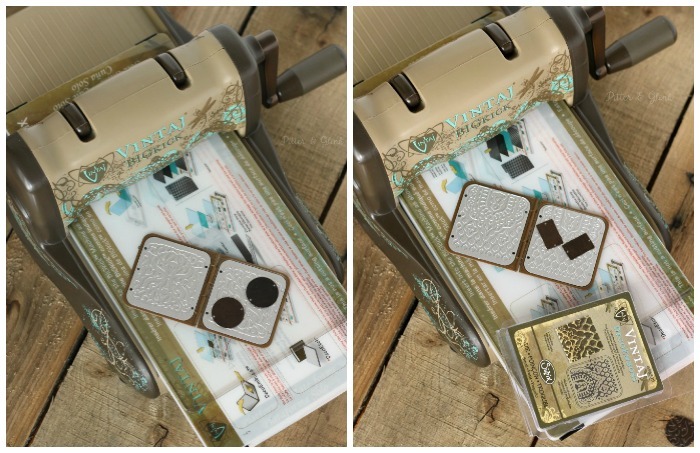 It's definitely a fun piece to wear, and the Sizzix BIGkick, along with the Vintaj blanks and Vintaj DecoEmboss dies, made it really easy to create. 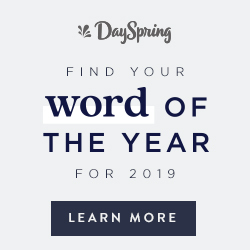 NOTE: While I received free product from Sizzix to create my necklace, I was not paid for this post, and the ideas and opinions contained in the post are 100% mine. 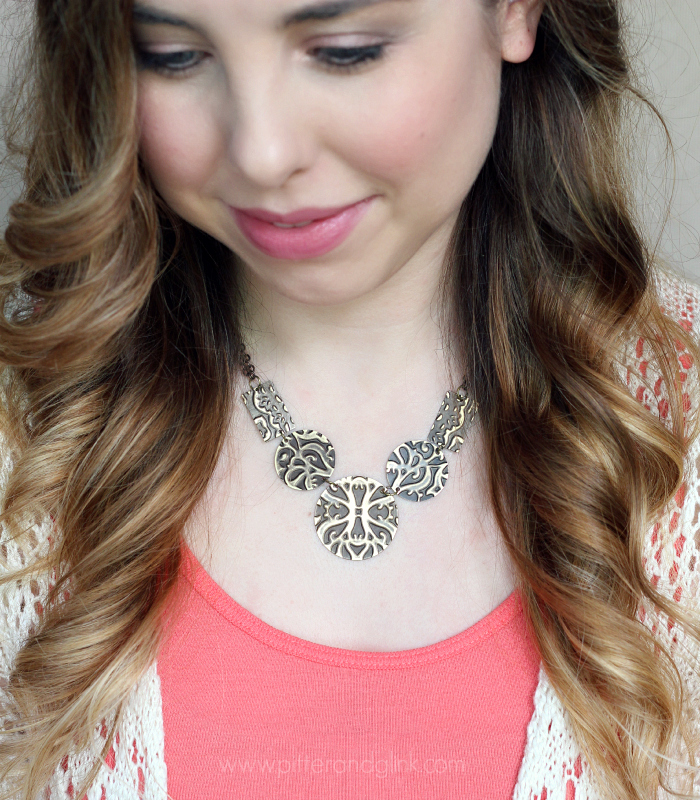 Bethany, your necklace turned out simply stunning! Beautiful Bethany, I checked some of this stuff out at Hobby Lobby and decided it was not for me to invest in another beautiful craft. I will leave it for the young. You are a beautiful model. How beautiful is this piece. I love howe you can use Sizzix for many porjects.